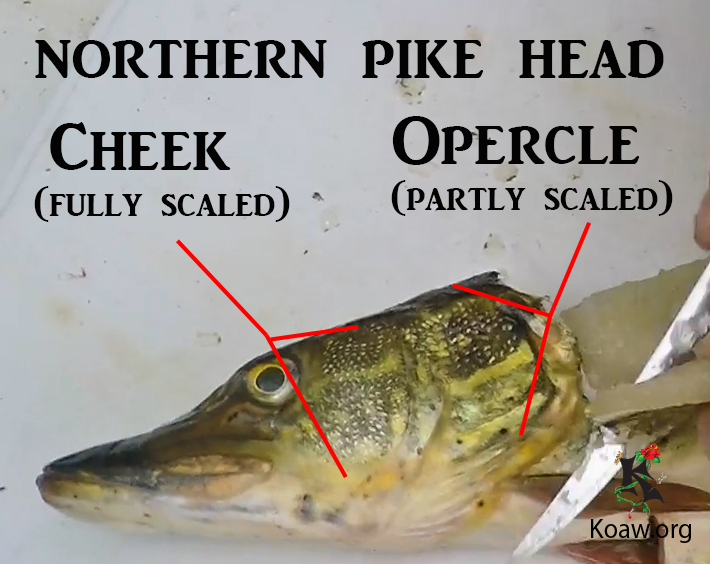 Esox Comparison - How to Tell Muskellunge, Northern Pike, and Pickerel Apart. The Esox genus is a lovely one and definitely one of my favorites. They are beautiful creatures, fun sport fish, and good eats. Depending on the waters, different fish of the same species may vary extensively in visual appearance. Here are some meristic (countable traits) tricks for telling them apart. (Also see images below). Submandibular Pores: Count the # of pores (they look like little holes) on the lower jaw. A northern pike usually has 5 pores on a single lateral side of the jaw (10 in total). Branchiostegal Rays: Count the # of bones (they look like ridges of the skin) on the lower jaw, beneath the gills. The northern pike usually has 13-16, again counted on only a single lateral side. There are also simple observable differences between the species. (Also see images below). Scales on Cheek and Opercle: The presence of scales on the cheek and opercle (gill cover area) is a good characteristic to view. The cheek is the area just below the eye and towards the posterior (towards the tailfin). The opercle is the largest bone of the operculum and is also known as the gill cover, that hard flap covering the red-colored gills. Suborbital Teardrop: The presence of a dark line beneath the eye. The video below quickly explains what the LATERAL LINE of a fish is and what that means for your fishing game. Every angler should understand what the LATERAL LINE is on a fish. This video is a great AND QUICK visual aid for understanding how the lateral line works and how YOUR FISHING LURE attracts a fish. |(Indeed this clip is from my larger video on LURE SCIENCE found here: ► https://youtu.be/c-v6ezb8jY4 Thanks for watching!